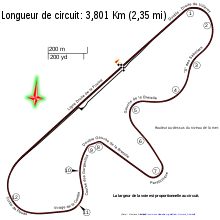 The 1984 French Grand Prix was a Formula One motor race held at Dijon on 20 May 1984. It was race 5 of 16 in the 1984 FIA Formula One World Championship. This was the final Formula One race to be held at the 3.801 km (2.362 mi) Dijon-Prenois circuit, as it was deemed too short by governing body FISA. Fittingly in France, Frenchman Patrick Tambay, in the all-French team (French car, French engine, French tyres and French fuel) scored the Equipe Renault team's last pole position. Double World Champion Niki Lauda won the race in his McLaren-TAG, his first win in France since 1975. Tambay finished second in his Renault RE50, with the Lotus-Renault of Nigel Mansell third. Lauda's team-mate and World Championship leader, Alain Prost, could only manage seventh after he was forced to pit to change a loose wheel. Andrea de Cesaris failed to qualify his Ligier, but nonetheless started the race and finished tenth. De Cesaris' Friday qualifying time was disallowed when his car's onboard fire extinguisher was found to be empty, before rain in the Saturday session prevented him from setting a time fast enough to make the grid. Ligier took the bizarre step of withdrawing their second car, driven by François Hesnault (who had qualified 14th), in order to allow de Cesaris to start 26th and last. * François Hesnault qualified 14th with a time of 1:05.850 in the first qualifying session. However, Ligier withdrew his entry in order for their #1 driver Andrea de Cesaris to start, after the Italian's Friday time was disallowed due to an empty on-board fire extinguisher in his JS23 and he could not post a quick time in the wet final session. 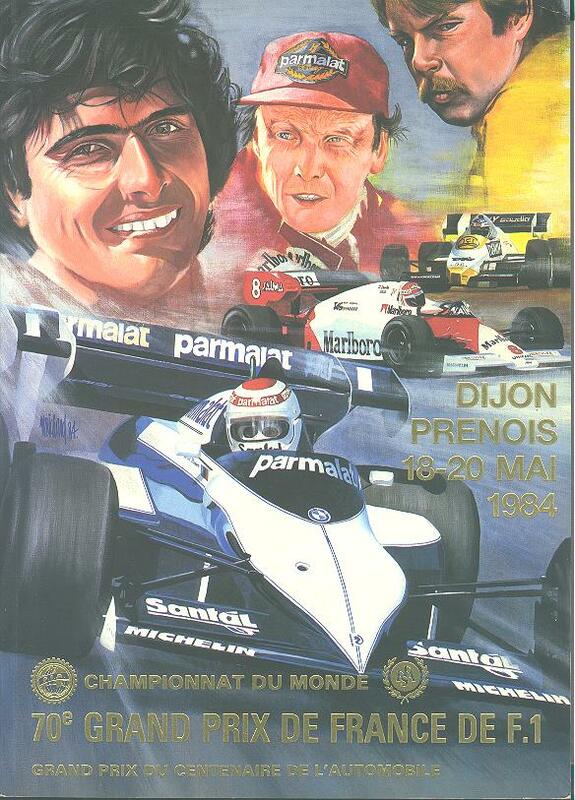 ^ "Motor Racing Programme Covers: 1984". The Programme Covers Project. Retrieved 22 October 2017. ^ "1984 French Grand Prix". formula1.com. Archived from the original on 4 November 2014. Retrieved 23 December 2015. ^ a b "France 1984 - Championship • STATS F1". www.statsf1.com. Retrieved 17 March 2019. This page was last edited on 17 March 2019, at 16:52 (UTC).